Am I Eligible for Alimony in a Denver Divorce? Can Alimony be Modified After Divorce? Can I Get Sole Child Custody As A Parent In Denver, CO? Do Men Have an Equal Right To Child Custody in Colorado? How Do I Avoid Owing High Attorney Fees? How Do I Get A Protection Order In Colorado? How Do You Calculate Child Support or Spousal Support? There’s an App for That! How is Child Support Determined in a Divorce? How Long Before a Wedding Should You Sign a Prenup? How Much Are Attorney Fees for Divorce in Denver? Is A Business A Marital Asset In Divorce? Is Mediation Required in Colorado Divorce? Is my Prenup Enforceable in Colorado? Should I Get A Premarital Agreement Before Getting Married In Colorado? What Can I Do If I’m in a Violent Relationship and Need a Divorce? 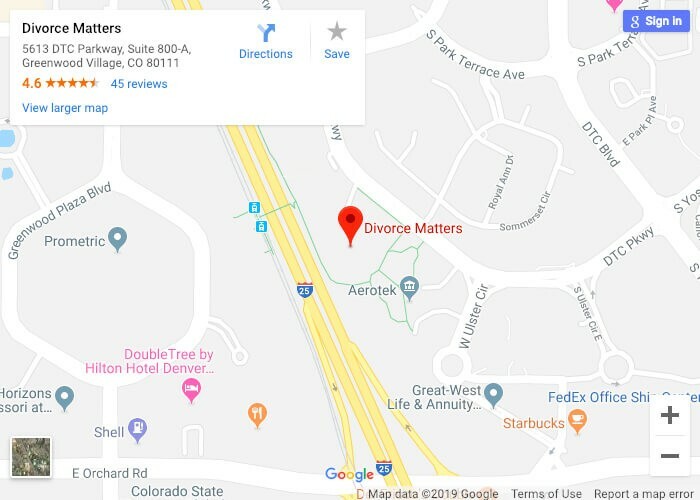 What Happens During Mediation for Divorce in Denver? Will A Prenup Prevent Me From Having To Pay Off My Spouse’s Student Loans? What are Some Good Reasons to Reduce the Amount of Alimony I Pay? What Happens To My Retirement Money In Divorce? Should I Ask For Spousal Support In My Divorce? How Much Alimony Will I Receive In Divorce? What Are My Options For Dividing The Marital Home In Divorce? When Can I Modify Spousal Support Payments? What is Bird’s Nest Custody? What Do I Do If My Ex Is Not Paying Child Support?